Doric Marketing chief Dorian Davies is gearing up to promote advanced automated marketing strategies to hot tub retailers as one of the new exhibitor recruits at the UK Pool & Spa Expo. The seasoned wet leisure specialist and industry guru will be promoting innovative CRM technology, which helps to attract more customers effectively, during his debut appearance as an exhibitor at the third outing of the UK Pool & Spa Expo; running from January 22 to 24 at the Birmingham NEC. 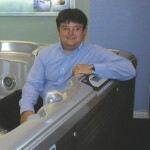 Dorian believes that hot tub retailers and wet leisure companies should be capitalising on the recent high-profile TV and media exposure for the industry, which has included the recent ‘Hot Tub Britain’ documentary by ITV, by engaging more with consumers and existing customers with the help of automated systems. “This is an exciting time for the wet leisure industry and we are looking forward to exhibiting our services during the third instalment of the UK Pool & Spa Expo,” said Dorian. “We will be promoting our wide range of tried-and-trust marketing services and eCommerce capabilities for hot tub and wet leisure companies, plus highlighting the benefits of automated marketing systems. “Times have changed in marketing. In previous eras, it was all about communicating collectively to mass audiences. Things have now moved on. “If you are to succeed and thrive going forward, it is imperative that you communicate personally with every individual prospect or customer and address their individual needs in a personal and authentic way. “Consumers pay attention to brands when motivated to do so. The best way to earn their attention is through exceptional interactions and valuable education. “Savvy small businesses owners know that the experiences and interactions that consumers have with brands shape their decisions to buy, or keep looking. This is why companies need to be interfacing with new prospects as early as possible in the buying cycle, so that they can shape and influence the ultimate buying decision. Dorian will be able to provide further details about his services while appearing on the Doric Marketing Stand 12 at the UK Pool & Spa Expo.